Supreme Court nominee Brett Kavanaugh listens to Sen. Rob Portman, R-Ohio, on Capitol Hill in Washington, during a meeting Wednesday, July 11, 2018. 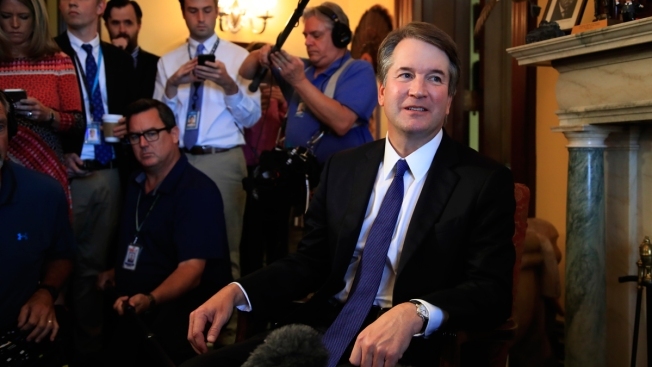 The Senate Judiciary Committee plans to begin confirmation hearings for Supreme Court nominee Brett Kavanaugh on Sept. 4, Chairman Chuck Grassley, R-Iowa, announced Friday. Grassley expects the hearings to last three to four days, his office said, with opening statements delivered on Sept. 4 and the questioning of Kavanaugh to begin on Sept. 5, NBC News reported. The Judiciary panel has received more than 184,000 pages of records from Kavanaugh’s work as a White House lawyer and his work for Independent Counsel Ken Starr.